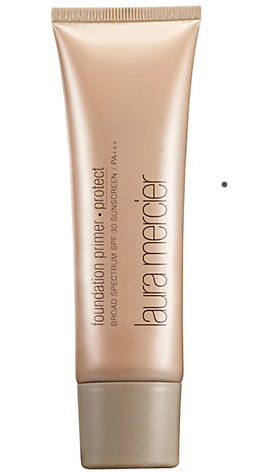 Laura Mercier Foundation Primer Protect…. Yummy! And at £28 for 50ml it won’t break the bank, hurrah! It’s only really in the last couple of years that I’ve become really aware of the benefits of a good primer. To date my primer-of-choice has always been Smashbox Photo Finish, but now it has a rival for my affections in Laura Mercier Foundation Primer Protect. Admittedly I don’t really know much about Laura Mercier other than she is a celebrity make up artist renowned for her ‘flawless faces’ who subsequently launched her own cosmetics and skincare range. That’s enough for me really, as soon as I hear ‘flawless face’ I’m sold. It’s that simple! Whereas I described Smashbox as feeling like velvet, I’d say this primer feels like silk. It’s light and creamy without being greasy at all. 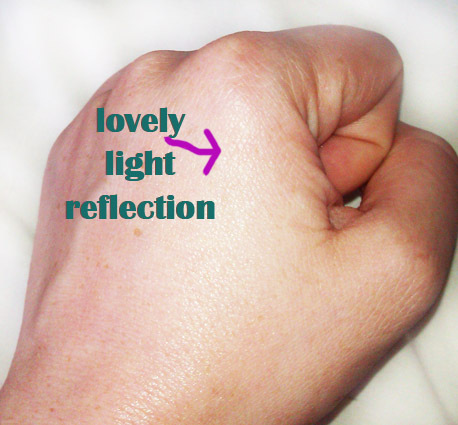 It feels light to wear and reflects the light beautifully (clearly, light features heavily in this review!) It doesn’t even out skin texture like Smashbox’s but it gives a gorgeous dewy complexion that everybody wants in summer. That brings me on to the added benefit of this primer. It’s got a SPF factor 30 against UVA and UVB rays. Even better for summer I hear you cry! Well, yes you’d be right. As it feels so light you can wear it with or without foundation and other skin products and it won’t feel too ‘cloggy’. Personally I hate feeling like I’ve got a lot of make up on, which is why I only wear really light foundations and then, only occasionally. This is a great product for me then, somehow it feels slightly cold when you apply it, not in a ‘brrr-chilly’ kind of way, more like ‘aaah-fresh’. It’s the sort of thing I actually enjoy applying. Although it does have SPF protection it’s always best to be cautious in summer. Yet, sometimes in winter it’s sunny and, with the best will in the world, I never remember to wear sun cream then. Let’s be honest, who does? Well, now I don’t have to and I won’t feel guilty about it either. The soft creaminess of this primer will help moisturise and protect my skin whilst faking a soft natural glow. What more could you want? This entry was posted in Product Reviews and tagged Laura Mercier, Primer, Skincare. Bookmark the permalink.